*The remains of St Francis de Sales and St Jane Frances de Chantal rest within two different sarcophagi near the communion rail at the base of the main sanctuary. 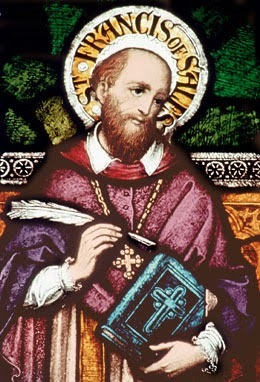 St Francis de Sales is on the left and St Jane Frances de Chantal is on the right. Each sarcophagus is overlaid with a bronze relief depicting the saint’s image. *During the French Revolution the Visitation nuns transferred the heart of St Francis de Sales from Lyons, France to Treviso, Italy. Today this relic remains in Treviso and rests within the church at this monastery. The relic is located on the right side of the nave. If the relic is not visible kindly ask a nun to raise the protective screen.